As a result of continuous mutations and recombinations Hepatitis B Virus has evolved, much like Influenza A Virus, into several genotypes. Eight genotypes of Hepatitis B Virus (A-H) are currently recognized, and subgenotypes have recently been described in four of these genotypes (A, B, C and F). The genotypes show a distinct geographical distribution between and even within regions. Genotype A is prevalent in Northern and Central Europe but is also common in Southeast Asia, North America and sub-Saharan Africa. Genotypes B and C are confined to Asia. Genotype D is widespread but is the predominant genotype in the Mediterranean region, including the Middle East and India. Genotype E is found mainly in West Africa. Genotype F shows the highest divergence among the genotypes and is indigenous to aboriginal populations of the Americas. Genotype G has been found in the USA and Europe. So far, Genotype H has been encountered in the Americas. In 2008, several reports[2,3] were published that a possible new genotype was circulating in Southeast Asian countries, such as Vietnam and Laos. Research indicated that Hepatitis B, genotype I was the result of a complex recombination pattern, suggesting it was formed outside of Southeast Asia before spreading within Laos and Vietnam, and giving birth to a new genotype with subgenotypes, which later recombined with regional strains. 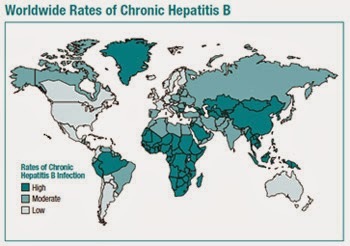 This certainly shows that Hepatitis B Virus is constantly evolving, recombining and mutating and it’s only a question of time before the existing vaccines will not protect us anymore.